July | 2007 | Wong Family Inc.
Ama 是一个皮肤敏感(轻微)患者, 但由于怀孕时鱼, 虾, 蟹还是照吃不误(而且还吃不少), 结果造成真, 善和媄的皮肤直到现在还是对昆虫(咬伤)都非常非常的敏感. 对于食物, 值得庆幸的是, 小朋友们除了一岁以前吃了香蕉, 蛋黄嘴边会长红点之外, 到目前为止, 海鲜, 蛋, 花生… 这一类的所谓敏感性食物对他们却完全没有影响了. This entry was posted in Family Time on July 31, 2007 by wc9. Today, May ‘harvested’ her farming labour of the last 2 weeks – spring onion sprouts! 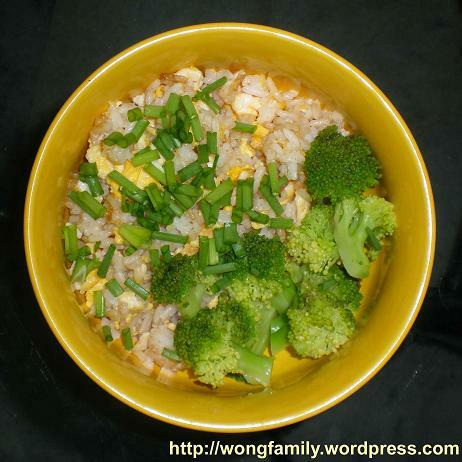 Ama used the sprouts to sprinkle on top of fried rice with egg and May was extra happy and excited about the meal. 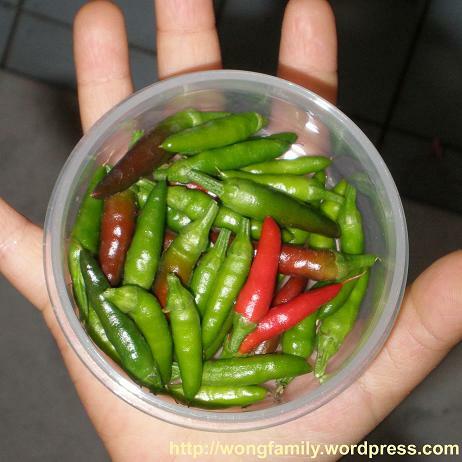 Ama’s little chilli have also been harvested and used to cook chilli chicken.